Does Your Photography Website Meet Google's Mobile Criteria? Does Your Photography Website Meet Google’s Mobile Ranking Criteria? Google now use expanded criteria for checking mobile-friendliness as a ranking signal. This change will affect mobile searches in all languages worldwide and will have a significant impact in mobile search results. This is to help users find it easier to get relevant, high-quality search results that are optimized for their devices - is YOUR photography website ready for the "mopocalypse"? April 21st 2015 – that might sound like just another ordinary day, just another unremarkable Tuesday. Except there seems to be a wave of something that can only be described as growing panic sweeping across the Internet as April 21st looms closer. Some are so terror-stricken by it that they’ve resorted to calling it the “mopocalypse” or “mobilegeddon” – you could be forgiven for thinking it’s the dreaded Y2K bug, all over again, if you remember what that was like! Of course, you know that when Google uses strong language like “significant” and “worldwide” that it spells certain trouble for us mere mortals. On top of that, Google made the announcement about 3 months ahead of time, to give everyone time to panic and make the necessary changes needed to avoid being caught up in some kind of Internet tsunami that threatens to wipe out our mobile search traffic. Now, if they’re giving us a whole 3 months to prepare, then it can only mean the proposed changes are going to be world-ending for those who fail to evolve and adapt, right? Well, it’s not quite that bad. This is still a pretty momentous change, and a lot of photographers do have some serious work to do for sure, but why are Google doing this? Does Your Website Meet Google's Mobile Ranking Criteria? You can’t possibly have missed the fact that mobile devices are everywhere. You’re probably reading this article right now on your smartphone, and we live in a world where it’s normal to text our own family members just to get their attention, even if they’re in the same room with us. For example, the next time you go out to eat, take a quick look around the restaurant. How many families do you see that are actually fully engaged and talking to each other? How many of them have their heads bent down, captured by the hypnotic attraction of whatever app they’re hooked into on their phone? A lot of them, no doubt. In fact, if you’re bored and want to spoil a perfectly good family dinner by inciting a domestic riot, try implementing a “no phones” policy at the dinner table combined with mandatory conversation. Google seems to know where to find these answers, and more, and which are the best websites to go to for any given search. But, not all websites look good on the smaller screen of your typical mobile device, do they? Some of them look positively hideous compared to their desktop versions. Pinching, magnifying, endless scrolling, buttons you can’t press, and text you can’t read without an electron microscope – these are just some of the problems we encounter on websites that are not mobile-friendly. For Google, whose primary goal is to help their customers find the things they’re looking for, this has created a real problem. After all, how can they, in all conscience, show websites in their search results that will only frustrate mobile users? They’ve actually had this on their minds for some time already, since November 2014 in fact, and you may have noticed the subtle appearance of the phrase “mobile friendly” next to search results on your phone for websites that Google has already deemed compatible with your mobile device. Google simply wants to make it easier for those using mobile devices to reach those websites that have been optimized for use on the device they’re using. So why is everyone panicking about this? In a way, we’ve been trained to expect the worst whenever anyone at Google does so much as sneeze. Because some of Google’s past algorithm changes have been known to cause major upheavals in the search results (notably Penguin, Panda and Hummingbird), it appears we’ve been conditioned to run screaming for the hills whenever they announce anything like this. Therefore, if you believe all the scare-mongering, and your website isn’t mobile-friendly right now, you can be forgiven for thinking that your website rankings will fall faster than Superman after catching a block of Kryptonite in mid-flight. In reality, though, it’s probably not going to be that bad for most photographers, especially if you’ve already done a good job of optimizing your site for search to begin with, but there will definitely be consequences if you fail to meet the criteria for being mobile-friendly. The uncertainty lies around how big those consequences will be. For example, if you rank on page one for mobile search today, will your site suddenly be lost in the desert as a forgotten relic once the changes take effect? Will you drop just a few places, or plummet like a brick, to be relegated to the basement? A breakdown of the search volume in the USA by device type for the keyword “professional photographer”. Mobile devices account for 36% of the total, and that number is climbing every day. What we do know is that, at present, mobile searches account for between 40-60% of the total, so there are still a lot of searches being done via desktop computers and laptops, so that’s one consolation. We also know that Google only said that the use of mobile-friendliness as a ranking signal will be expanded. In itself, that’s no cause for widespread panic and, while we don’t yet know the full effect this is going to have, it’s unlikely to be some kind of ranking apocalypse, as many have suggested. The truth is, no one knows right now, not even the folks at Google, because there are just too many variables at play. They include many hundreds of different metrics and ranking signals in their algorithms, and mobile-friendliness will be just one of those, but who really knows how much weight Google is going to give it in their calculations? My personal guess is that while mobile-friendliness will obviously be a significant ranking factor for searches performed on mobile devices, its effect will be much more pronounced for websites that also score poorly for other ranking signals, especially those in areas related to the overall user experience. Even now, websites that fit that description probably don’t rank all that well to begin with, but will likely do even worse with the weight of this added factor helping to drag them further down the search results. Which is, of course, good news for those who do make the effort to keep Google happy. Before we get too fired up and start preparing for the end of civilization as we know it, what does Google actually mean by the term “mobile-friendly” anyway? Regardless of what we think about it, the only definition that matters is the one Google uses, since that will form the measuring stick by which your website will be so cruelly judged. In other words, as suspected, the user experience must be a pleasant one that doesn’t interfere with the normal usage of the website or cause people to click the wrong links and end up in places they didn’t want to visit. How Can You Tell If The “Mopocalypse” Will Get You? The first thing you should do about all this is discover whether or not your website is actually going to be affected. Just because your web designer says your website is mobile-friendly, or it looks good enough to you when you visit your own website or blog on your phone, doesn’t necessarily mean that Google will share that opinion with you. To help you with that, Google have provided a useful tool as part of their webmaster tools system that will tell you, categorically, whether or not a page passes their criteria. It’s called the “mobile-friendly test“. You can use Google’s mobile-friendly test tool to see if the pages on your photography website pass the criteria defined by Google. To use it, simply paste the URL for one of your pages into the box and click the handy “analyze” button to perform the test. You can repeat this test across a sample of different pages of your website, which should give you a pretty good idea of where you stand in the grand scheme of things. There’s also more information to be had about this in your webmaster tools account, which you can find in the “mobile usability” part of the “search traffic” section. Either you’re heaving a great sigh of relief knowing that Google is happy with you, or you’re hyperventilating from a mild panic attack because you can see straight into the jaws of the mopocalypse as it heads straight for you! What Should You Do To Survive Google’s Changes? So, things turned out just as you feared they would. Your website has been deemed “non mobile-friendly”, “mobile-hostile”, or simply “website non-gratis”, or whatever it is that Google uses to label it as an Internet miscreant. First, take a deep breath from a brown paper bag, or get Sheldon Cooper to prepare you a hot beverage, and then grab a towel to flag down a passing spaceship… actually, the hot beverage might be the better choice. But seriously, this is not the end of times – there are ways you can fix this! The formula (or algorithm) that Google uses to decide the mobile-friendliness of your web pages runs in real time, as opposed to being restricted to a few index updates each year. This means that Google will actively assess the state of your pages every time the Googlebot crawls them. In other words, when you fix any pages that do need updating, Google will take note of that the next time they crawl those pages, and award them the coveted “mobile-friendly” label right away. Of course, if your web pages are usually slow in getting indexed because they’re not updated very often, then it’s important to make them mobile-friendly as soon as possible, and then alert Google to the changes by resubmitting the appropriate sitemaps in your webmaster tools. While it’s not strictly necessary to resubmit your sitemaps, it can’t hurt, and it gives Google a bit of a “see here” kind of nudge in the right direction. You might think that Google attaches the “mobile-friendly” label to your website as one big entity, but that determination is actually done on a page-by-page basis. What that means is, if you have 20 pages on your website and 15 of those are deemed to be mobile-friendly but 5 of them aren’t, then the 5 pages that are not mobile-friendly will be the ones to suffer in the rankings. The other 15 will most likely be safe. This is good, for example, if you have specialist sections or specific pages that would be difficult to make mobile-friendly. In those cases, you can at least be comfortable in knowing that those pages that are mobile-friendly should not suffer any penalty. Obviously, making all of your pages mobile-friendly is going to be important, given the continued growth of mobile usage, but you can at least decide and prioritize any required changes on a page-by-page basis. If you do find yourself in the unfortunate position of being ostracized by Google because they don’t like how your website appears on mobile devices, what can you do about it? The first thing to do is to take a look at the framework or platform that your website is built on to see if there’s any kind of mobile-friendly update that will take care of this for you. However, if you’re one of those unlucky souls who are still using a Flash-based website, you’re going to be in bad shape, but it’s possible that the templates built on good old HTML will have something in place to get you back into Google’s good books. If that strategy fails to bear fruit then it might be possible for you to write some additional custom CSS-styling for your website that will make it mobile-responsive. Another possibility is to create a mobile-specific version of your website. Doing that will redirect mobile users to a sub-domain that has a specially-coded mobile version of the main website. While this will work for both users and the Google algorithm, it has the disadvantage of creating more work for you because you now have two websites that need to be kept in sync with each other. Speaking as someone who tried this route a couple of years ago, I can say it was not worth the effort and it created more headaches than it solved. In fact, at best, I would label the dedicated mobile-specific website as a temporary solution only. The most favored method of all to solve this is to use a fully mobile-responsive template across your entire website and blog. 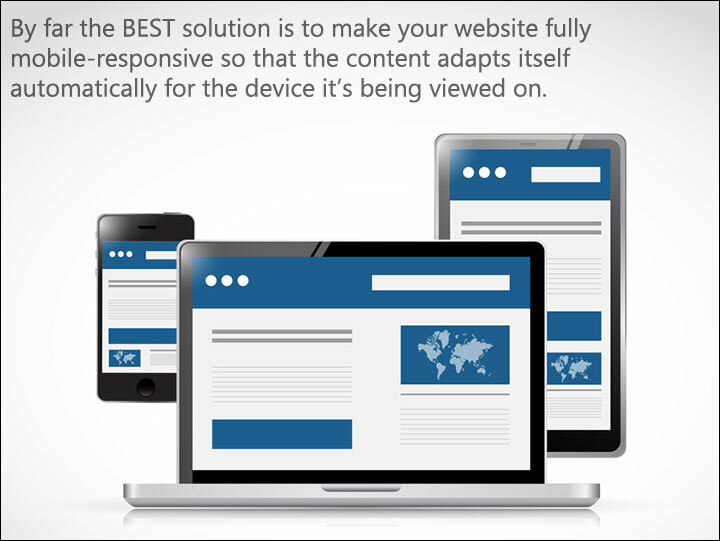 By far the BEST solution is to make your website fully mobile-responsive so that the content adapts itself automatically for the device it’s being viewed on. This is where WordPress users have an advantage because most of the WordPress themes out there are now mobile-responsive right out of the box. For example, Photocrati and Studiopress are the two theme systems I most recommend, making the process of optimizing your website and blog for mobile almost seamless and invisible. In fact, if you’ve been thinking of moving your website to a self-hosted WordPress-based platform then this might just be the perfect excuse to tackle that project to give your online presence a much-needed update and protect you from being cast into obscurity by Google’s mobile ranking changes.